The Model SR oval gear flow meter from Kytola provides reliable, accurate oil flow monitoring for industrial applications. As a positive displacement meter, the Model SR is designed to always show the correct rate of flow, irrespective of changes in temperature or viscosity in the oil. 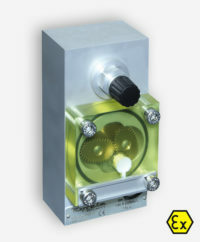 The Model SR instrument is constructed with a transparent cover for a readily visible indication of flow, and can be made with NPT or BSP connectors. Alternative products in a similar style include the Model SRx and the Model SRx-x.